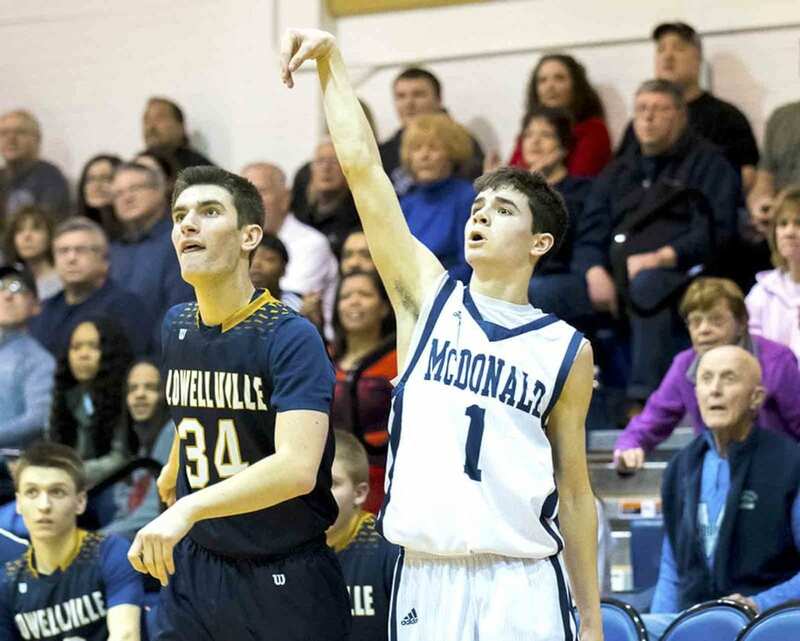 Special to Tribune Chronicle file photo / Dianna Oatridge McDonald’s Zach Rasile (1) watches after releasing a shot during a game last season, when he passed the 1,000-point mark as a sophomore. McDONALD — Each dribble echos like surround sound, bouncing off the walls of the McDonald High School gymnasium. It’s the steady beat of Zach Rasile, one he’s had rattle though his head like a metronome since he was 4 years old. The swishing sound of basketball grazing the nylon hanging from the circular, orange rim. Bouncing off the backboard, it’s a rare occurrence. One thing you can take to the bank is the 6-foot McDonald junior is usually honing his skills inside the home of the Blue Devils. Rasile reached 1,000 points as a sophomore and averaged 28 points per game against box-and-1, triangle-and-2, face-guarding or double teams. He drove the lane for 48 percent shooting from the floor, or used his hop and exploded up for 41 percent from 3-point range. That’s not to mention him taking those rare moments to stand still on the hardwood to shoot 88 percent from the foul line — including 18 of 18 against Waterloo. He has more information on his resume than most normal people achieve in a lifetime, that’s with two years to go in his high school career. His father, Jeff, is McDonald’s coach. Jeff has been in the gym with Zach from that first dribble inside the gymnasium. Zach averages 800 shots a day and around 4,000 a week. When he sees the ball go through the hoop a couple of times, it gets him into a rhythm. Sometimes the expectations are almost unrealistic. Zach tries to emulate Jimmer Fredette, the former BYU standout and NBA player. In a sense, it’s like looking into a mirror for Zach, who sees similarities in the shooting style. Ironically, Fredette was on the highlight reel for posting 75 points for the Shanghai Sharks in a 137-136 loss earlier this month. If Zach had that kind of performance it would rank 10th all-time according to the Ohio High School Athletic Association’s single-game record. 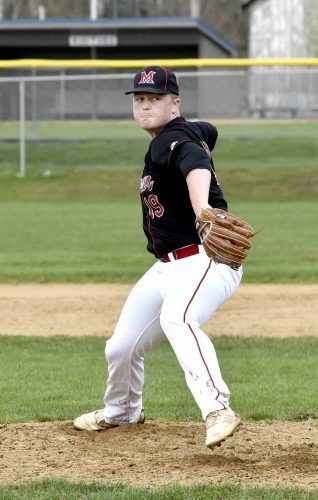 It would surpass Rex Leach’s 1955 record of 72 points when Vienna beat Southington 158-46 on Jan. 22 of that year. There’s this season, something that’s Zach has built upon for the previous two seasons. He’s the OHSAA record holder for 3-pointers in a season with 140, but he’s more than just a long-distance threat. “Where he’s improved is attacking the rim,” Jeff said. “People don’t understand he’s got a really good handle. They don’t see it because we rely on him to shoot the jump shot. He’s got so much better attacking the rim. Zach has been in contact with some Division I schools, but the line is usually the same from the major schools — wanting shooters at least 6-4. He’s grown a couple of inches from his freshman year, about five inches. Jeff said his son is 155 pounds now, but should get up to 175 when he’s 18 or 19 years old. He’s been working with former McDonald guard Anthony Pugh, who privately coaches area basketball players. Zach and Pugh work a couple of times a week. Pugh is familiar with Jeff’s expectations. Jeff loves Pugh’s passion for the game, which comes through in the hour-plus workouts with Zach. It’s given him perspective. There are days off where Zach just sits around with his friends and plays Xbox — just being a teenager. As much as it would seem, Zach’s life isn’t entirely in the gym. His parents make sure there is a balance. Zach has logged many hours in the McDonald High School gym, spending time with his father. Jeff has eased up in recent years, letting his assistant coaches and others like Pugh take over the teaching process. Jeff is Zach’s coach, which has its give and take, just like any father would realize with his teenage son.